In our line of work, we get to experience the exciting yet complicated world of influencer and brand matchmaking. We connect Millennial influencers with brands to promote their products and ideas. We’ve dealt with some pretty interesting situations and quirky people on both the influencer and brand sides. These exciting but often cringe-worthy moments taught us a few lessons about what to do – and more importantly – what not to do when speaking to and partnering with brands. Consider these pieces of advice as you encounter new opportunities to be sure to build every brand relationship into a successful partnership. When recruiting influencers for a social media marketing program, brands and agencies often send dozens, if not hundreds, of emails to potential partners. Emails often include a registration link or another call-to-action. To set yourself apart from the crowd and enhance your likelihood of securing a spot on the final list of participants, make yourself known to the program organizer. Send a direct email with your media kit or explanation about why you make the perfect candidate for the program. Brands look for influencers with authentic engagement, so creating a personal connection with the brand shows you are more likely to create authentic content relaying their message. Keep in mind most brand employees work normal hours and are constantly connected to email. 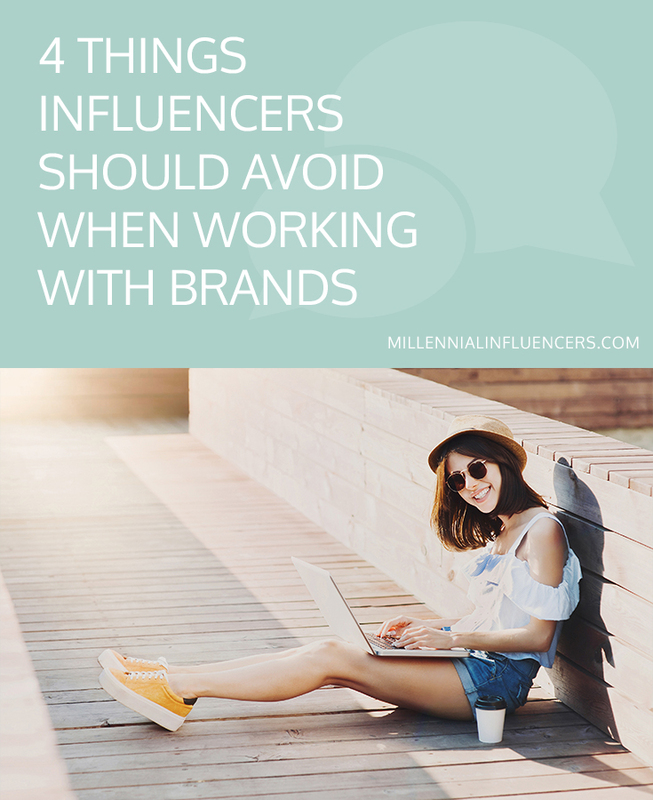 Although remote work and flexible hours are perks of the blogger/ influencer career, you must make availability and communication a priority in your business. Brands expect influencers to respond promptly to emails and inquiries. Of course, this is important in terms of securing new business because you don’t want to wait too long when an opportunity presents itself, but it’s also important when you’re already involved with a brand. Companies go through a lot of effort to locate, vet, recruit, and select influencers, and they often see the influencer/ brand partnership as a business transaction. When an influencer is slow to respond or difficult to communicate with, the brand sees it as a disappointment in the business endeavor. Prompt communication can make an influencer stand out just as much as it can damage a relationship. Brands often provide very specific goals and talking points for influencers in order to convey specific information about the brand and products to potential customers. These businesses expect influencers to be just as intentional with their posts as the brands are with their marketing. Make sure to check and double check the program criteria before delivering the ask. If you make a habit of hitting every detail of the agreement, chances are the brand will want to continue to work with you on future programs. When brands work with influencers, they are paying for your service of posting a photo, sharing an affiliate link, participating in an ambassador group, etc. Generally, an influencer’s service is generating content, brand awareness, or expertise that is shared with his or her audience. Nothing is more disappointing to a brand than feeling like they paid for something that fell short of their expectations. Imagine if you bought a grande caramel macchiato from Starbucks and instead you were handed a tall dark coffee with milk? You’d be disappointed, right? The same goes for brands: they expect nothing less than what is “ordered.” What if, in the Starbucks scenario, the barista handed you a venti caramel macchiato with a cake pop on the side all for the price you paid for the drink? You’d want to keep going back to that Starbucks, right? It works the same in the brand/ influencer business transaction: if you want to stand out, make a habit of over-delivering on every project, and you will develop lucrative relationships with brands over time. The best way to interact with brands is to approach the relationship as a mix between a business partnership and a business transaction. At the end of the day, successful business endeavors are defined as mutually beneficial partnerships. Essentially, what this means for influencers and brands is that influencers should provide exceptional service to pave the way for continued growth. What brand relationship strategies have worked in your influencer business?